Border Crossings is a quarterly cultural magazine edited and published in Winnipeg. A local, international magazine, it is now in its 37th year of continuous publication. Edited by Meeka Walsh, it investigates contemporary culture through a combination of articles, reviews, interviews and portfolios of photographs and drawings. More curated than edited, Border Crossings occupies a vital place in the geographic centre of the North American continent. The magazine is committed to Northrop Frye’s sense that the centre is where you are, and so we take Winnipeg as the place from which we begin looking at the culture and art of the world. Border Crossings does what our name says. We cross the borders where one art form moves into another; where art and architecture intersect; where video reflects film; where painting continues its talk with photography; where fiction and poetry work their continual reinvention of language. We are interested in the places where one art meets another; we like being between things, and we find the edge when the art we’re looking at takes us there. Our focus is the art of writing and the act of talking. 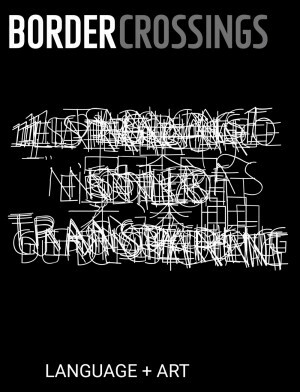 Border Crossings is recognized for the quality and clarity of its criticism and for the richness and insight of its interviews. Each issue contains a lengthy review section, in which exhibitions, books, performances and events from around the world are treated to significant reviews. Every issue includes “Artist’s Pages”, a three to five page section where a selected artist constructs a small visual world. These pages appear unannounced and nuanced. Nothing in Border Crossings is like anything else. Meeka Walsh’s editorials are meditations that take the form of condensed essays on language, ideas, books, places and architectures. From the beginning, the magazine focused on the interview as a way of both informing and delighting our readers. Over the last 37 years, Border Crossings has published 270 interviews with a range of artists unequalled in any other contemporary art magazine; a partial list includes Robert Motherwell, Roy Lichtenstein, Robert Frank, Rebecca Horn, Carolee Scheemann, Michael Snow, Harmony Korine, Yoko Ono, Hermann Nitsch, Shozo Shimamoto, Orlan, Roni Horn, Eric Fischl, Charline von Heyl, Chantal Joffe, Tom Sachs, Susan Rothenberg, Suzy Lake, Jeff Wall, Dan Graham, Rodney Graham, Mike Nelson, Gillian Wearing, Guy Maddin, John Waters, David Altmejd, Brian Jungen, Cecily Brown, John Currin, Dana Schutz. The interviews, which consistently run 15 pages in the magazine and include a framing introduction, are conducted by Robert Enright and Meeka Walsh, and are regularly reprinted in catalogues and subsequently included on the websites of the artists’ galleries. 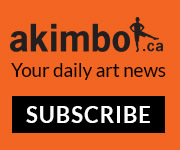 Border Crossings has been recognized by the publishing industry as Canada’s most significant arts magazine. It has been nominated for 175 awards at the National and Western Magazine Awards, and has won 67 Gold and Silver Medals at their annual competitions in Toronto and Vancouver. Border Crossings is the only magazine ever to have won The President’s Medal at the Nationals and been named Magazine of the Year at the Westerns in the same year. The magazine’s editor, Meeka Walsh, was also given the Lifetime Achievement Award by the Western Magazine Awards Foundation in recognition of her “outstanding contribution to the magazine publishing industry”. Outstanding is a word that readers, artists, curators, gallerists and advertisers have come to associate with Border Crossings. Our form follows the needs of their various functions.